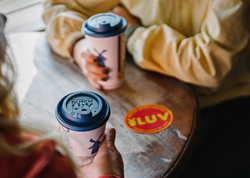 On Thursday, February 14, Dutch Bros Coffee will celebrate Valentine’s Day with ‘Dutch Luv Day.’ The annual campaign raises money for local organizations that help feed the hungry. “We can’t think of a better way to spread ‘Dutch Luv’ on Valentine’s Day than to help those who need it the most in our communities,” said Travis Boersma, co-founder and CEO of Dutch Bros.
On Dutch Luv Day, every Dutch Bros location will donate $1 from each drink sold to a local non-profit of the owner/operator’s choice. According to the Oregon Food Bank, every $1 donated equates to three meals. Last year, customers raised enough money for 945,000 meals. This year, Dutch Bros is hoping customers will raise funds for more than 1 million meals. This is the 13th year Dutch Bros and its customers have supported organizations feeding the hungry. Dutch Luv Day began as a canned food drive in 2007. In 2016, Dutch Bros stopped gathering food and, instead, started donating $1 from each drink sold. The change allows organizations to address specific needs in their communities. To find a Dutch Bros location near you, visit http://www.dutchbros.com/locations.